Ah, writing. How I have missed you. I was 27,000 words–about halfway through–the first draft of my YA psychological thriller, Untrue Crime, when my friend Kay Lynne Simpson (aka The Nightowl) passed away suddenly. I called it a half-Nanowrimo (like a half marathon) and stopped writing to help the other local fen with Kay’s needs, and then to grieve. Now it’s six weeks later and I’ve only just re-opened the document. I started writing back in 1997, when Kay Lynne told me I had to. I’m ashamed to say my first fanfic is still on the net if you know where to look. Then in 2007, I decided to go pro, quickly contracting my first novel, Gym Dandy. Now it’s 2017 and this is the longest I’ve ever gone without working on a book, either writing or editing. I’ve been doing a wee bit of marketing, but not a heck of a lot of that, either. So just in time for the holidays, I’m back at it. I’m re-writing the opening. Instead of taking chapter after chapter to get to the main story action as I usually do, it’s now in the very first scene. I’m pretty pleased with it. Of course that means deleting a bunch of stuff, but tighter writing trumps word count. Get your Murder, Mayhem and Mystery here! Guardian Angel. Stalker. It’s a fine line. Read “Summer Stalk” in the crime-filled anthology, “Villainous Vacations” now available for pre-order. EXCERPT: Conner stares into his locker, leaning forward as far as he can without actually climbing inside. She steps closer, squeezing his arm. I step closer, too. Pushing off the wall, I redirect and head over to the glass display case, pretending to read the dusty trophies. A bead of sweat tickles the hollow of my spine. “I hear your parents are out of town. Want me to come over tonight?” Cheryl’s lips flap like huge, pulpy wings. At least they do in the distorted reflection in the big brass trophy. Oh, look. We won the Kiwanis Festival in 1992. Playing in Chuck Wendig’s Sandbox! The amazing and erudite Chuck Wendig kindly lent me his blog for the day. 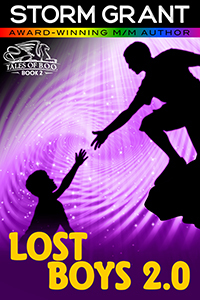 Come on over and find out 5 entertaining and brief things I learned writing Lost Boys 2.0. Read it here.